These are so simple and quick, you just won’t believe it! And whatever toppings you love! Ham and pineapple, Turkey pepperoni and mushroom, fresh tomato, Kalamata olive and feta, leftover chicken breast with pesto, etc. 1.) Preheat your oven to 450 degrees. If you are only cooking for one or two you can use a toaster oven to save energy. 2.) To make clean up a snap, I like to put parchment paper underneath the pitas on a large cookie sheet, but you may want to just use non-stick cooking spray. 4.) 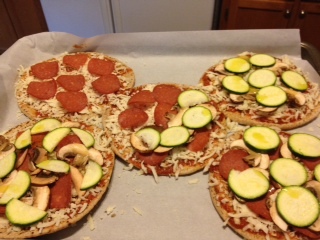 Spread a thin layer of mozzarella cheese all the way to the edges, then top with your favorite toppings. The kids love to do this and eat a lot more when they can make their own. Try to slice veggies very thin if raw or use leftover grilled, steamed or roasted veggies. 5.) I love to drizzle a little garlic infused olive oil on mine, or finish with a little Parmesan cheese. 6.) Bake in 450 oven on the middle rack for 10 minute (crispy crust), then turn to broil for 2 minutes. 7.) Allow the pizza to set for just a couple minutes to cool. 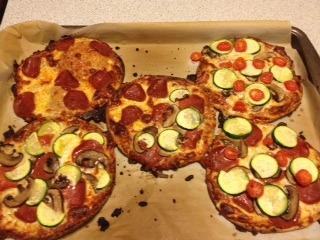 I moved them to a cutting board or plate before cutting them with the pizza cutter or butcher knife. Oh yum!! Now I am hungry 😀 thanks for sharing the recipe! Shancerely, let me know when you try it! Thanks for followings! 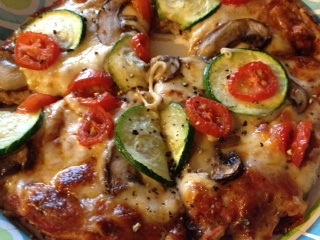 We love homemade pizza! 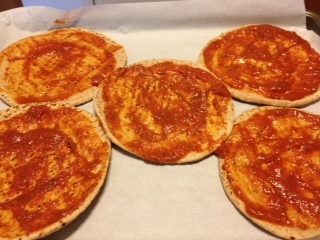 We use lavash bread for a thinner crust and then add italian seasoning. Every Friday night! Leah, that’s great! There are lots of whole grain lavash breads available now. What kind do you use? I also like sprouted tortillas, but the kids prefer the thicker crust of the pita. Thank you for reading and commenting! !